A flash drive, smaller than a package of chewing gum, has made it much easier to move computer files around. These inexpensive drives can hold dozens of gigabytes of data, more capacity than a standard computer hard drive a decade ago. But with this convenience comes risk. Because these drives are so small, and are normally carried in a pocket or purse, they can be easily lost. If they happen to contain sensitive files – personnel information, for example – they can pose a data breach. 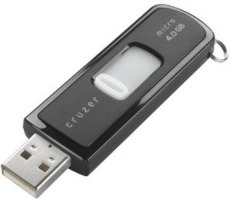 Flash drives can also be infected with malware, and evidence suggests many are. Paul Ducklin, of Sophos Security, reports his firm recently purchased the USB flash drives sold at a rail company's lost property auction. Two-thirds, Ducklin reports, contained Windows malware. Read Also - Click Here!